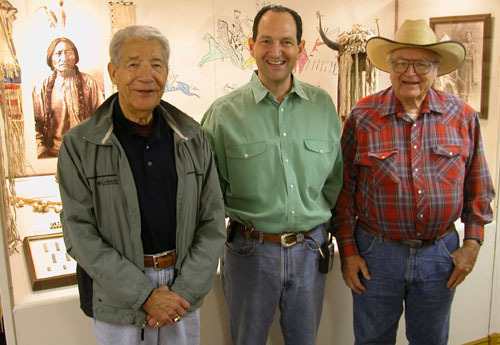 GARRYOWEN , MT -- Last week, the historic town of Garryowen was honored with a visit by Forrest Girard, an enrolled member of the Blackfoot tribe, and his lifelong friend Stan Stephens, an enrolled Crow Tribal member. Mr. Girard is the grandson of Frederick F. Girard, who served under General Custer as Reno ’s interpreter at the Battle of the Little Big Horn. for a picture with Chris Kortlander, director of the Custer Battlefield Museum. Mr. Forrest, now 80 years old, makes his home in Albuquerque , New Mexico , and is in Montana visiting Mr. Stephens of Prior, Montana . Both gentlemen made the trek to Garryowen to visit the Museum and see the place where the Battle began.